Cheap Custom Bottle Opener Flashlight Keychains, Personalized in Bulk. Promotional. Best prices in USA, Canada. Cheap Custom Bottle Opener Flashlight Keychains, Personalized in Bulk. Promotional. Budget Prices for USA, Canada. Blue, Red, White and Black. 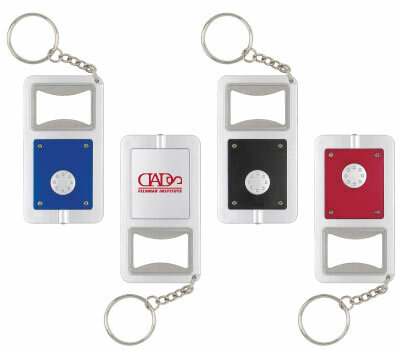 Bulk Bottle Opener and Light Keychains, custom imprinted with your logo. We also supply wholesale blank (not personalized) Bottle Opener Key Chains for $0.78 each. Budget Prices in USA and Canada for promotional Bottle Opener and Light Keychains in Bulk. American clients pay no taxes. The unit prices below include your 1-color custom imprint on one side of the Bottle Opener Keychain. We also supply blank (not personalized) Keychains in bulk for $0.78 each (minimum quantity: 250). Extra color or location: add $0.20 per color, per side. Production Time: 7 days after art approval; Blank Bottle Opener Keychains ship next day. GUARANTEE: We guarantee all product for imprint quality and against manufacturer's defects. Your satisfaction is guaranteed. OVERRUNS AND UNDERUNS: We will ship the EXACT quantity you have ordered at no additional charge!